Murderous outlaw’s steal the identity of young Easterner named Bob Walker. Six Gun’s Walker’s son, Bob Walker (James Hickman), comes to Tuckerville to collect his legacy. 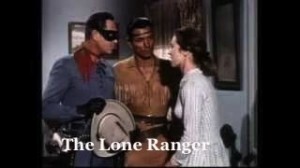 A look-a-like, Emmet White (James Hickman) assumes Bob’s identity but sharp-eyed Tonto spots the fake and with the Lone Ranger, they save the life of the real Bob Walker and help him to collect his $80,000 inheritance from the banker, Ezra Barr (Hal Price). Dr. Hiram Tucker (Ian Wolfe) has two sidekicks, Curly Williams (Don Haggerty) and Dirk Slade (Jimmy Dundee). I believe that Dirk is actually called Dan throughout this episode.